The trail map products identified with the KMZ logo include the same trail and POI data as the X Package products. Our trail data in KMZ format is compatible with a growing number of third party GPS apps for mobile devices and custom third party gauge systems. Our Smart Phone data is supplied in KMZ format which is the compressed form of Google Earth KML format. The Google Earth application can be used to convert between KMZ and KML formats. 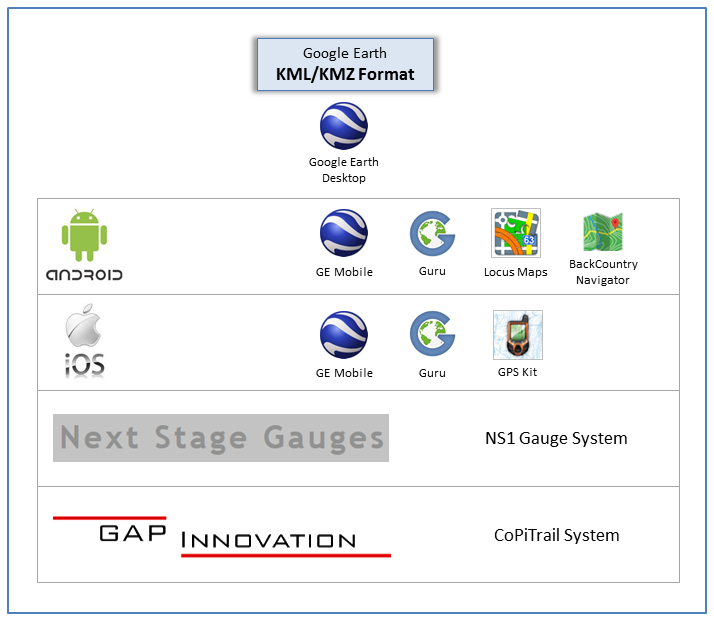 The following GPS apps and gauge systems have been verified to properly display our KMZ format map data. Currently, the third party GPS apps identified below do not have auto-routing algorithms for turn by turn directions but do provide all other basic functions of a Garmin GPS. Our trail data in KMZ format can be imported and overlaid on a variety of background maps such as street maps, topographic maps or satellite imagery offered by many third party GPS apps in the Google Play and iTunes stores. The KMZ format trail data can be downloaded instantly from your account directly to your mobile device. Refer to our Help page for more information. For third party gauge systems, contact the vendor for installation instructions.